The mother of nature has bestowed her child Bangladesh with lush of greenery,biodiversity and unique ethnicity of its people. It is situated on the northern part of the Asia bordering West Bengal, Meghalaya and Assam in the North; Mizoram Raj jay, Assam and Tripura in the East; West Bengal and Myanmar in the West; the Bay of Bengal in the South. 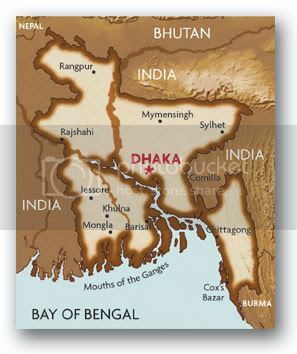 the total area of Bangladesh is 1,47,570 square km. Almost 58 rivers have crisscrossed this land. Thus it’s known as the land of river. Bangladesh is also known as one of the largest Delta shaped islands in the world, formed from the sediment of the Brahmaputra River flowing down from the Himalaya Mountains, as well as the Bay of Bangle. These sediments made its soil fertile, suitable enough to grow myriads of flora and fauna. Bangladesh is blessed with six seasons around the year. They are summer, rainy, autumn, late autumn, winter and spring. Each of the seasons continues for three months. Moreover, it has a tropical climate; mild winter (October to March); hot, humid summer (March to June); humid, warm rainy monsoon (June to October). We have the largest mangrove forest of the world ‘Sundarban’ where on of the endangered animals the ‘Royal Bengal Tiger’ lives, it is the place where you get to see this unique kind of tiger. Not to mention, we also have the longest beach of the world ‘Cox’s Bazar’ along with a coral island named ‘Saint MartinIsland’. In Bangladesh you can see the magnificent way the nature has bloomed herself. Why Eco-tourism is necessary for Bangladesh? Eco-tourism in our country was introduced only a few years ago. Through this we will be able to develop the tourism field in our country as well as we can preserve our wild life and nature. As, it is a tourism that aims towards preserving the nature, not only our country will be economically benefited but also it will not harm our environment and its ecology. Although our country is enriched with natural resources however the people are not aware of it and harming it unconciously without knowing the effect of it. For example the people are visiting the beaches and throwing the wastes into sea without a second thought. There isn’t any people to clean it or to stop them to do it. However, if Eco-tourism is established in our country then not only the people , the government will also pay attention towards the preservation of our nature. By introducing this agency, this is our first step towards it. For protecting our environment and its diversity and not to disturb its ecosystem we are lending our hands towards you, hope that you will also respond to it.